Incubation is the first step for a project to be considered among the diverse Open Source initiatives overseen by the ASF. A submitted project and its community will join the more than 50 projects in the Apache Incubator, and will benefit from the Foundation’s widely-emulated meritocratic process, stewardship, outreach, support, community events, and guiding principles that are affectionately known as "The Apache Way". TDF is therefore willing to start talking with Apache Software Foundation, following the email from ASF President Jim Jagielski, who is anticipating frequent contacts between the Apache Software Foundation and The Document Foundation over the next few months. Over the long-term, we plan to work with other Apache contributors to extend the vision of productivity beyond documents. We are learning much more about the semantic web through our additional work on LotusLive Symphony, and the vision in the research and lab teams has to extend productivity into new realms. Meanwhile, the Apache community can be expected to accelerate adoption of ODF as a primary set of document formats, and to drive ODF compatibility in other products and solutions in the future. says Ed Brill. 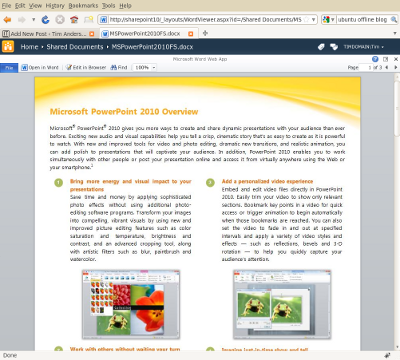 It is good to read about new approaches to productivity, because this has been a weakness in OpenOffice which is sometimes perceived a a kind of inferior-but-free equivalent to Microsoft Office. In the meantime, Microsoft has worked to make its own suite more distinctive, to defend a territory that accounts for a significant share of its profits. The ribbon user interface is part of that strategy, but more significant is its integration with SharePoint, and the emergence of Office Open XML as a unifying format for editing documents in desktop Office and within the browser using Office Web Apps. Unifying the open source teams behind OpenOffice and getting it away from Oracle are both important steps towards making the project more compelling. Oracle says OpenOffice non-strategic, ceases commercial versions. Time to reunite with Libre Office? The OpenOffice story has taken a curious turn today with Oracle announcing that it intends to cease the commercial versions of this office suite and to move the project a non-commercial organisation. In this dialog, louis_to is Louis Suárez-Potts who works at Oracle as OpenOffice.org community manager. We believe the OpenOffice.org project would be best managed by an organization focused on serving that broad constituency on a non-commercial basis. We intend to begin working immediately with community members to further the continued success of Open Office. We will continue to make large investments in open source technologies that are strategic to our customers including Linux and MySQL. Oracle is focused on Linux and MySQL because both of these products have won broad based adoption among commercial and government customers. The question now: will Oracle try to set up an independent foundation to compete with the Document Foundation? Or will there be a reconciliation, which would seem the only sensible way forward? Background: OpenOffice was originally a commercial suite called Star Office. It was bought by Sun and made free and open source in an attempt to loosen Microsoft’s hold on business computing. While OpenOffice has been popular, in the business world OpenOffice has had little impact on the success of Windows and Office. That said, it is possible that Microsoft’s development of the Office Ribbon and the huge effort behind Office 2007 was partly driven by a desire to differentiate and improve its product in response to the OpenOffice competition. I’ve been reviewing Office and SharePoint 2010, and trying out Ubuntu Lucid Lynx, so I thought I would put the two together with a small experiment. 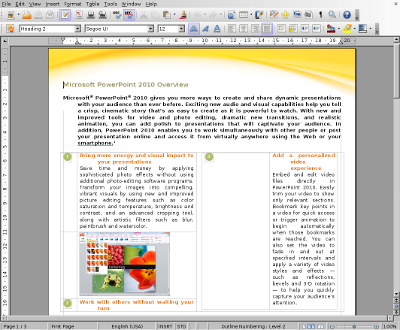 I borrowed a document from Microsoft’s press materials for Office 2010. Perhaps surprisingly, they are in .doc format, not the Open XML .docx that was introduced in Office 2007. 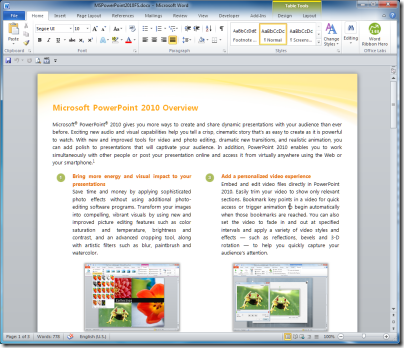 That didn’t suit my purposes, so I converted it to .docx using Save As in Office 2010. Then I stuck it on SharePoint 2010. Next, I downloaded it to Ubuntu and opened it in Open Office. It was not a complete disaster, but the formatting was badly messed up. Finally, still in Ubuntu, I navigated to SharePoint and viewed the same document there. It looked fine. Even better, I was able to click Edit in Browser, make changes, and save. The appearance is not quite WYSIWYG in edit mode, but is the same as in IE on Windows. The exercise illustrates two points. One is that Open Office is not a good choice for working with Open XML – incidentally, the document looked fine when opened in the old binary .doc format. The other is that SharePoint 2010 and Office Web Apps will have real value on mixed networks suffering from document compatibility issues with Office and its newer formats. I was convinced at the time, and remain convinced today, that the division of OOXML into Strict and Transitional variants was the innovation which allowed the Standard to pass. Enough National Bodies could then vote in good conscience for OOXML knowing that their preferred, Strict, variant would be under their control into the future while the Transitional variant (which – remember – they had effectively rejected in 2007) would remain purely for the purpose of accurately specifying old documents: a useful aim in itself. It is also a worrying commentary on the standards-savvyness of the Office developers that the first amateur attempts of part-time outsiders find problems with documents which Redmond’s internal QA processes have missed. I confidently predict that fuller validation of Office document is likely to reveal many problems both with those documents, and with the Standard itself, over the coming years. 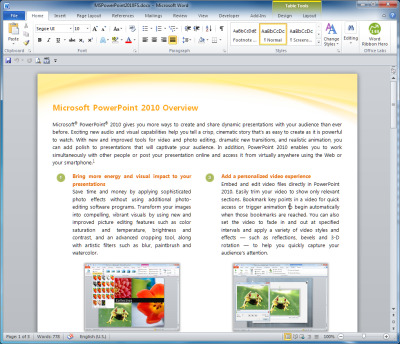 Note that Brown is basing his remarks on the preview of Office 2010; we have not seen the final release yet. I can believe that Microsoft may fix some issues, but it looks vanishingly unlikely that Office 2010 will implement the “Strict” standard which ISO approved. As for Open XML, it’s notable that Microsoft neglects to mention it at all in its Reviewer’s Guide, even though this is supposedly the release that will fully implement ISO/IEC 29500. It is odd how this has gone from a cause to campaign for, to not-worth-mentioning in just over a year. To be fair, few users ever cared about XML formats themselves: it is only when documents get scrambled or fail to open that such things become important. No wonder Microsoft said nothing about it, if in reality it has lost interest in conformance. without a change of direction, the entire OOXML project is now surely heading for failure. then the company will only have itself to blame. Its nightmare will re-emerge: entire governments mandating OpenOffice for the sake of standards conformance. That said, and despite the hype, I regard Office 2010 as a minor release. 64-bit Excel, a few tweaks, and a first foray into browser-hosted versions. Microsoft often displays this pattern, following up a release with major changes – Office 2007, for example – with one that is really just a refinement of what went before. It is not impossible that somewhere in the corridors of Redmond a team is working on a new Office that does a much better job with the Open XML standard. Over to Microsoft – serious about Open XML? Or just doing the minimum necessary to protect a lucrative market dominance – maybe a bit less than the minimum? Update: Microsoft’s Doug Mahugh has replied to Brown’s comments here. I am writing separately about this.